Make a bunny mask and wear it for Easter parties and treasure hunts. You can make multiple copies of them, for a full party theme. 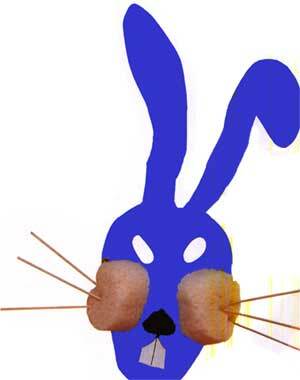 Make this fun rabbit mask to wear on Easter morning. The white bath sponge cheeks are plump and soft. The plastic straw whiskers are visible from even at a distance. That makes the rabbit mask even more sensitive than a real one. Well, how can you imagine them unless you give them a try? 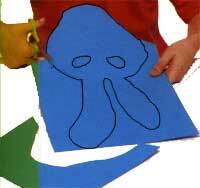 Draw and cut out a rabbit's face and ears from thin colored cards. Use your scale to measure 30cm(12 inches) wide and 60cm(24 inches) long cut out. To make the rabbit's cheeks, draw a large circle on both bath sponges and cut them out. Make the circles as large as possible. Then trim them to fit. Draw a mouth with the felt-tip pen. Cut out a nose from black paper. Then cut a pair of teeth from white paper. Glue them on to the mask. Glue on the sponge cheeks using PVA glue. The sponge will absorb the glue. So apply lots. Allow plenty of time for the glue to get dried. Ask an adult to cut the pointy ends off the plastic straw. Dab a little PVA glue on to one end of each of those straws. Now insert three straws into each sponge discs. The whiskers are now ready. Well, if you think the whiskers are getting unnecessary long, you can trim those jut-out ends a little. Now make a small hole on either side of the mask. Thread a pipe-cleaner through each hole and twist the end to hold it in place. To wear the mask, hook the pipe-cleaners around your ears. Hey you're almost done. But if you want to make them a bit more realistic, use your imagination to paint the mask with black, white and red paints. Mix black and white paint on a palette to make a pale gray color. Use a medium paintbrush to paint the front of the mask. But do not paint the ears. When face is done, mix more of black and paint the ears with it. Caution: If you decide to color do it before applying the glue.